Marina Mirage is the Gold Coast’s premier destination for boutique shopping, waterfront dining, and an enviable lifestyle offering. Situated at Main Beach the Centre lies directly opposite the five star Sheraton Grand Resort & Spa and is adjacent to the world’s first Palazzo Versace hotel. Housed within the intimate boutique setting of this elegant Centre you will find many of the world’s and Australia’s most celebrated fashion brands.Christensen Copenhagen, Tommy Hilfiger, Gazman, GANT are among the favourite brands peppered throughout Marina Mirage, along with Local Boutiques and designers Sonia Stradiotto Couture, Janine Edwards, Element, WYSE, and Anthony Leigh Dower boutiques. At Marina Mirage, you can enjoy countless ways to spoil yourself and the special people in your life. Whether it’s finding a stunning piece from Calleija Jewellers, exploring the unique homewares at Domani & Co. viewing divine works art at Anthea Polson Art or indulging in luxurious beauty and pampering services at Esteem Medi Spa. Marina Mirage is also famous for its waterfront dining. On the waterfront boardwalk and overlooking the floating marina you can relax and enjoy afternoon cocktails or indulge in a deliciously decadent lunch or dinner at one of the many award winning restaurants including Omeros Bros. Seafood Restaurant, Glass Dining & Lounge Bar, Ristorante Fellini, Sky Restaurant and King Crab Co. The Marina Mirage weekly Gourmet Farmers Market is a favourite with locals who prefer farm fresh, organic, local produce. Held every Saturday from 7am until 12 you will find the ultimate selection of gourmet fresh produce and food artisan delicacies. With over 70 designer boutiques and restaurants, at its spectacular waterfront location, Marina Mirage is one destination you cannot miss. Opening in September 1988, Marina Mirage was originally developed in response to the needs for a luxury shopping destination to service the Sheraton Mirage Resort. The centre was also developed for the burgeoning Gold Coast consumer appetite for premium brand merchandise, high end fashion and superior dining experiences, reflective of the unique waterfront locale. From these early luminous beginnings, Marina Mirage set the benchmark for style, design and lifestyle and was quickly adopted as the premier shopping destination for affluent international and local clientele. In May 2009, Queensland’s most iconic waterfront shopping, dining and leisure destination underwent a 40 million dollar redevelopment revealing a brand new look and an even greater selection of designer stores and restaurants. 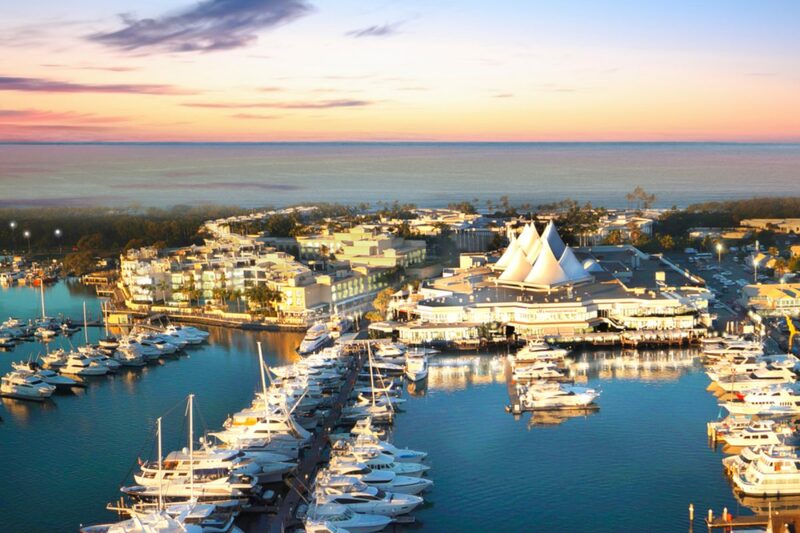 Today, Marina Mirage holds and unrivalled reputation as Queensland’s premier shopping, dining and lifestyle destination. With future plans for redevelopment due to be announced in 2018, Marina Mirage will continue to hold a special place in the hearts of locals and the aspirations of visitors from around the globe.